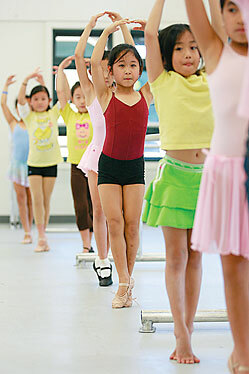 Kindergartners learned the basics of ballet yesterday in Autumn Ogawa's Ballet 1 class in the recently completed Josephine Flanders Dance Pavilion at Punahou School. Flanders, who founded the school's dance program in 1952, taught and produced ballet performances for 30 years, and the facility was named in her honor. Dance instructor Jacie Oda busts a move with her students in her Street Dance class. 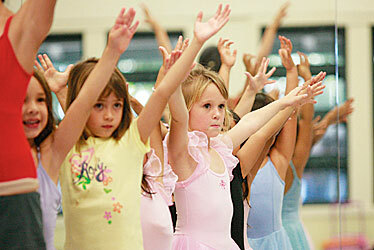 Students aged 7-, 8- and 9-years aim for balance and perfection in Chansri Green's Ballet 3 class.